Duck hunting is a way of life for us here at Waterfowl Specialist Guide Service, and in the south there is nothing like living off our beautiful wetlands. There is an unspeakable feeling of joy watching the sun rising and have a flock of ducks committed to the decoys. Having a guide that has born and raised in these marshlands with the ability to call any species of ducks is one of the many things we have to offer. All hunts or dun with Gator Trax boats with pop up blinds or stationary blinds for when the birds get educated. We take pride in customer satisfaction insuring to make for an unforgettable experience which will be sure to keep you coming back for more. Waterfowl Specialist Guide Service is now scheduling hunts for the 2014-2015 teal and duck season. Make sure to come experience some of the finest duck hunting Southeast Louisiana has to offer with St. Bernards own Capt. Jimmy Corley. He is a guide that takes pride in customer satisfaction making for a memorable time to leave you wanting to come back for more. And it shows with the abundance of repeat costumers. The dates or set for November 15 through December 7 and December 20 through January 25 If you would like to schedule a hunt you can contact Capt. Jimmy Corley by phone at (504)258-4431,or by email at cap.jimmy.corley@gmail.com. Also feel free to check out our web site waterfowlspecialist.comrnrnWe also have a boat slip for rent in Delacroix it has water ,electric and a nice fish cleaning area. Well while the 2014/2015 duck season has sadly come to an end, it surly was an amazing year. We were able to kill a verity of ducks, including an abundance of Redheads, also I was able to make some memorable hunts with some great people from all over. It really makes this all worth it to see the expressions of joy on peoples faces that lets you know you are doing your job. I couldn't ask for a better life or job. It really is truly amazing to be able to show our next generation our way of life down in the south. I would like to say a big THANK YOU to everyone that was apart of this years' season. Without you guys this wouldn't be possible and I look forward to another great season with ya'll next season. On another note while our duck season has come to a close our fishing season is arriving soon. If you would like to schedule a trip you can contact Capt. Jimmy Corley by phone at (504)258-4431, by email at cap.jimmy.corley@gmail.com, also check out our website at waterfowlspecialest.com rnrnDon't forget we have lodging available with an option of a cajun home cooked meals. I hope everyone is as ready as I am for this fishing season to kick off. It has already starting to look like this year is going to be a great one. The trout have been on, and with so many of them measuring at 11 1/2' you can pick threw them to make outstanding box. Also we are looking forward for spring to get here so we can move on the outside and catch some big beautiful trout, you'll just have to burn some fuel and cover some ground but it will surly be worth the ride. We are scheduling trips so if you are ready for some great fishing and making long lasting memories don't waste any time and call Capt. Jimmy Corley. rnrnAll of the fishing trips include poles, bait, fuel, tackle, ice, and cleaning of that days catch. rnrnIf you would like to book a trip you can contact Capt. 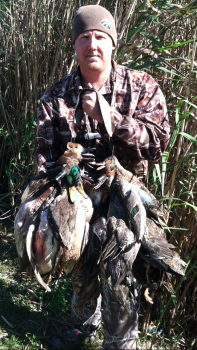 Jimmy Corley with Waterfowl Specialist Guide Service by phone at (504)258-4431, by email at cap.jimmy.corley@gmail.com. Also you can check out our website at waterfowlspecialsit.com rnrnAlso we have lodging available if needed with the option of home cooked cajun meals. I hope everyone is as ready as I am for this fishing rnseason to kick off. It is already starting to look like rnthis year is going to be a great one. The sheepheads, rndrums, and bull reds are starting to show. Just as long rnas the weather lets us get out there we can put some rnin the box. we are looking forward for the shrimp to come in so we can move on the outside and catch some rnbig beautiful trout, you'll just have to burn some fuel rnand cover some ground but it will surly be worth the rnride. We are scheduling trips so if you are ready for rnsome great fishing and making long lasting memories rndon't waste any time and call Capt. Jimmy Corley. rnrnAll of the fishing trips include poles, bait, fuel, tackle, rnice, and cleaning of that days catch. rnrnIf you would like to book a trip you can contact Capt. rnJimmy Corley with Waterfowl Specialist Guide Service rnby phone at (504)258-4431, by email at rncap.jimmy.corley@gmail.com. Also you can check out rnour website at waterfowlspecialsit.com rnrnAlso we have lodging available if needed with the rnoption of home cooked cajun meals. I hope everyone is as ready as I am for this fishing rnrnseason to kick off. It is already starting to look like rnrnthis year is going to be a great one. The sheepheads, rnrndrums, and bull reds are starting to show. Just as long rnrnas the weather lets us get out there we can put some rnrnin the box. we are looking forward for the shrimp to rnrncome in so we can move on the outside and catch some rnrnbig beautiful trout, you'll just have to burn some fuel rnrnand cover some ground but it will surly be worth the rnrnride. We are scheduling trips so if you are ready for rnrnsome great fishing and making long lasting memories rnrndon't waste any time and call Capt. Jimmy Corley. rnrnAll of the fishing trips include poles, bait, fuel, tackle, rnrnice, and cleaning of that days catch. rnrnIf you would like to book a trip you can contact Capt. rnrnJimmy Corley with Waterfowl Specialist Guide Service rnrnby phone at (504)258-4431, by email at rnrncap.jimmy.corley@gmail.com. Also you can check out rnrnour website at waterfowlspecialsit.com rnrnAlso we have lodging available if needed with the rnrnoption of home cooked cajun meals. This years duck season is fast approaching and with the duck population numbers up its sure to be a great season! We have started to book hunts already so make sure to call Capt. Jimmy Corley and schedule a trip today!! You can contact Capt. Jimmy by phone at (504)258-4431, by email at cap.jimmy.corley@gmail.com. Also you can check out our website at waterfowlspecialist.com, and our Facebook page at Waterfowl Specialist Guide Service.rnrnIf need be we have lodging with an option of home cooked Cajun meals available. THE DATES ARE IN!! Its' official the dates are out for this years duck season and with the duck population numbers up its sure to be a great season! Opening day for Teals will be September 12th - 27th, and for big ducks opening day first split is November 7th - December 6th. Second split will be on December 19th - January 17th. We have already started to book hunts, so don't miss out on your chance to book a trip. Make sure to call Capt. Jimmy Corley and schedule a trip today!! You can contact Capt. Jimmy by phone at (504)258-4431, by email at cap.jimmy.corley@gmail.com. Also you can check out our website at waterfowlspecialist.com, and our Facebook page at Waterfowl Specialist Guide Service.rnrnIf need be we have lodging with an option of home cooked Cajun meals available.